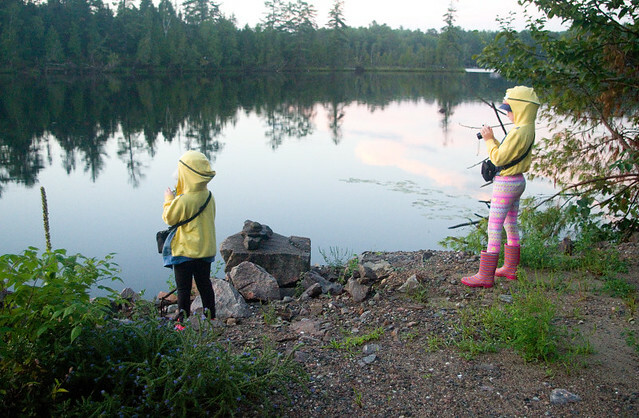 A few days ago at the cottage, the rain started at something like 6:00am and didn’t let up for another twelve hours. This wasn’t a warm, soft, summer rain that invites you to go puddle stomping. No, it was a cold, drenching downpour complete with thunder and lightning; it was a preview of fall. There were a few short breaks throughout the day, but the storm didn’t let up entirely until just before sunset. After a long day inside, my parents, my kids and I couldn’t wait to get out for a walk. 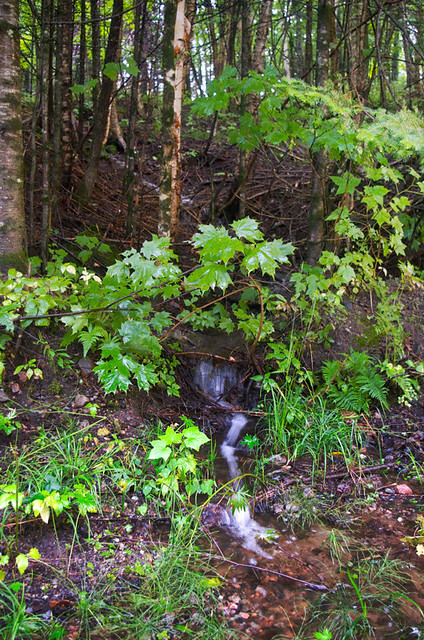 Small streams and even miniature waterfalls had sprung up in the aftermath of the storm, draining all of the water that the ground couldn’t absorb towards the lake. It’s been such a wet summer that the ground became saturated extremely quickly. The girls couldn’t have been happier, though, because this meant puddles and rivulets to splash in. Frogs were out in force, coming out into the damp after the rain to catch the evening mosquitoes. Of course, monkey see, monkey do. Thing 1 and Thing 2 insisted on bringing along some of my old cameras so that they could take pictures on our walk as well. I can think of worse things about me to imitate. Note that the girls are covered as much as physically possible by clothing. The bugs were really bad on that walk, what with a combination of the sun going down and the rain letting up. As so many of our nature walks do, this turned into an educational session. We identified as many birds as we could, even though I’m no birder. The bluejays, chickadees, and wrens flitted from tree to tree in front of us, and a flock of wild turkeys crossed the lawn in front of someone else’s cottage. We identified as many plants as we could as well, in my case focusing on the edible wild plants that I recognized. I’m not an expert on the subject by any means, but I am eager to learn. 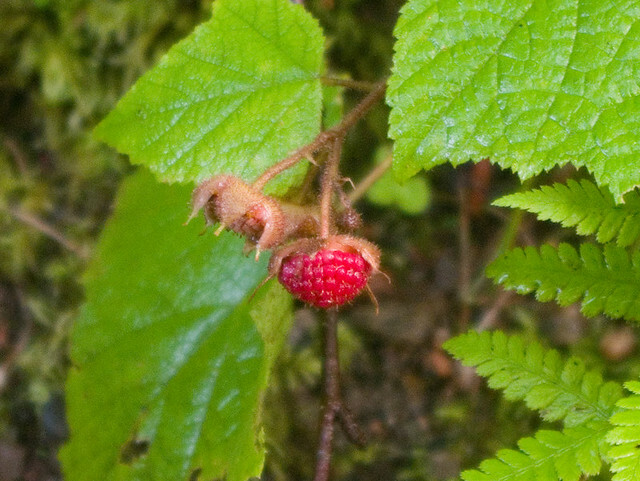 We did find a whole bunch of what I had always been taught were a variety of wild raspberry along the side of the road, and we picked a few ripe ones to eat. I’ve learned that these are actually called thimbleberries. I mean, I knew that they were edible, but for years I had been giving them the wrong name. 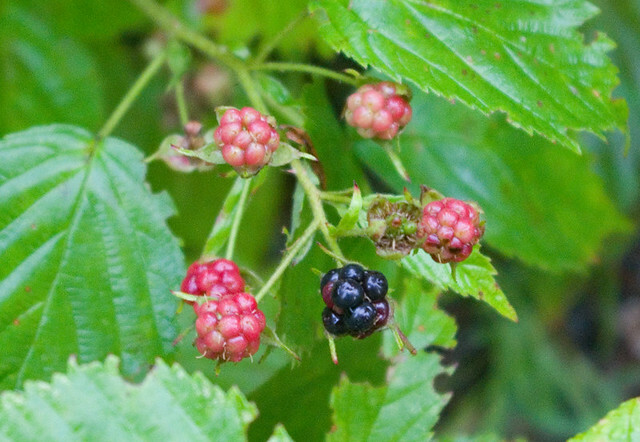 We also found a small blackberry thicket, and of course we had to pick every ripe berry we could reach. It ended up being only a couple of handfuls, but I wasn’t wearing the right gear to venture into the center of the patch. I was pricked enough by the thorns just reaching in past the edge. It was totally worth it, though, and I have mentally marked the area for future pilfering. 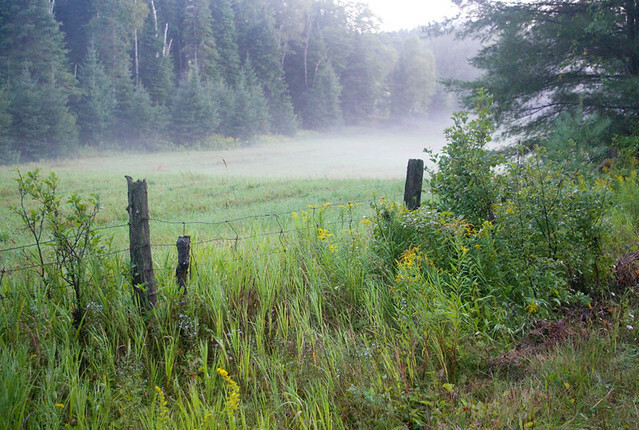 As we walked back to the cottage, a mist began to rise from the clearings and low-lying areas as the temperature rose very briefly before sunset.